GIS helps identify foster homes in a child's school district. Program helps children stay within familiar surroundings. "A child's universe is about 10 square blocks," observes Nancy Hughes, president and CEO of Volunteers of America of Illinois, a nonprofit organization involved in foster care in the Chicago area. "Within that world are the familiar touchstones of lifeschool, playgrounds, neighbors, and friendsa geography reflected in its familiarity, constancy, and comfort." As part of its mission, Volunteers of America of Illinois serves foster children referred by the Illinois Department of Children and Family Services (IDCFS), which now makes GIS part of the process for matching a child in need of foster care. Map of geocoded address (home where child was removed in red); nearby schools (green); nearby foster homes (yellow); and significant places, such as hospitals, parks, etc. (blue). Until recently, the assignment process could match a child with a foster home that was possibly 5, 10, or more miles from a child's community. It put children in the situation of not only being removed from parents and perhaps siblings but also from all the other aspects of their daily lifeschool, teachers, coaches, and friends. That changed when IDCFS began exploring how it might keep a child's existing school or school district in mind as a factor in foster placement. Keeping a child's school, services, activities, and social network constant while the child is going through disruptive changes at home could contribute to better outcomes in everything from academic performance, contact with siblings, and maintaining existing friendships to chances for reunifying with the natural parents. Hughes understands what IDCFS is hoping to achieve and what it means to children to stay in their school. "We know it's important because the kids tell us it's important," says Hughes. As Hughes worked late one evening to help place three children who had just been removed from their home, one of the children said to her, "Tell me I'm going to the same school and I can handle everything else." Since July 1, 2006, IDCFS has been using GIS software from Esri for geographic analysis in foster placement decisions. The process began several months earlier when IDCFS's Richard Foltz was asked by his boss, Jim Gregory, to demonstrate how GIS could incorporate school proximity into placement decisions. All senior managers would be present at the demonstration, including current acting director Erwin McEwen. A prototype application, coined SchoolMinder, was created for the demonstration and illustrated how GIS could integrate data and identify foster homes in a child's school district or catchment area or, if there are none, the closest foster homes to either the child's school or natural parents. And the prototype also showed GIS supported concentrating, in one office in Chicago, many of the placement worker functions that were distributed across offices throughout the state. Following the demonstration, the decision was made to move forward and begin using the SchoolMinder application to integrate school proximity in the foster placement process. SchoolMinder uses school point and polygon as well as street line datasets available from other Illinois state and local government agencies along with foster parent point files the department maintains for 50 partner agencies that have performance or incentive-based contracts for supervising thousands of licensed foster care homes throughout the state. When a child needs foster services, a placement worker has one hour to identify a home and arrange with a partner agency to make the placement. 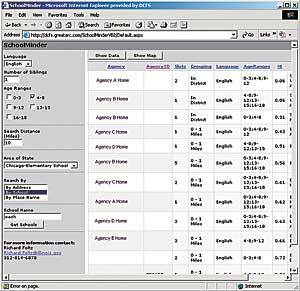 To begin, the placement worker uses SchoolMinder to enter either the school of the child (if known) or the address of the home from which the child was removed. Then, with a click of a button, the application performs a spatial search to see which of the available homes match the child's school geography. The results are then appended to a mainframe system for performance contract analysis of the partner agencies supervising the matching homes identified by SchoolMinder. The result is a rank-ordered list (the "call list") of the partner agencies that the placement worker uses to decide which partner agency to contact first. Final clinical analysis of the compatibility between the child needing placement and nearby homes occurs in the dialog between the partner agency and the child protection investigator that originally removed the child from their home for risk of subsequent abuse and/or neglect. If the partner agency first up on the call list decides not to place the child, the placement worker moves to the second partner agency on the call list, and so forth. Since deploying the SchoolMinder application, the average distances for initial foster care placement in Cook County dropped from 9.9 to 2.5 miles (median numbers dropped from 6.4 to 1.5 miles). Outside Cook County, the average and median dropped from 22.5 to 11.4 and 7.7 to 3.1 miles, respectively. Hughes observes that such an impact is an example of the potential nobility of technology. "There are so many things we can't control when removing a child from an unsafe situation and placing them in foster care," says Hughes. "It's amazing that we've found a way to leverage the spatial information. For the child, it's an extraordinarily wonderful thing." The benefits of the prototype application were clearly measurable, but so were the limitations. "We found with our prototype that all children weren't receiving the benefits of GIS equally," Foltz says. "The unit with access to the desktop application works normal business hours. But over half our placements occur outside business hours. It was clear that we needed to move SchoolMinder to a server environment and probably make it available 24/7 throughout the state." To reach the goal of making SchoolMinder available 24/7, IDCFS turned to Great Arc Technologies, Inc., an Esri Business Partner, to rewrite the desktop application into a Web-based interface served by ArcGIS Server technology. Brett Ward of Great Arc coordinated the development work. "Everyone is familiar with a Web browser, and most people are comfortable with that type of interface," notes Ward. 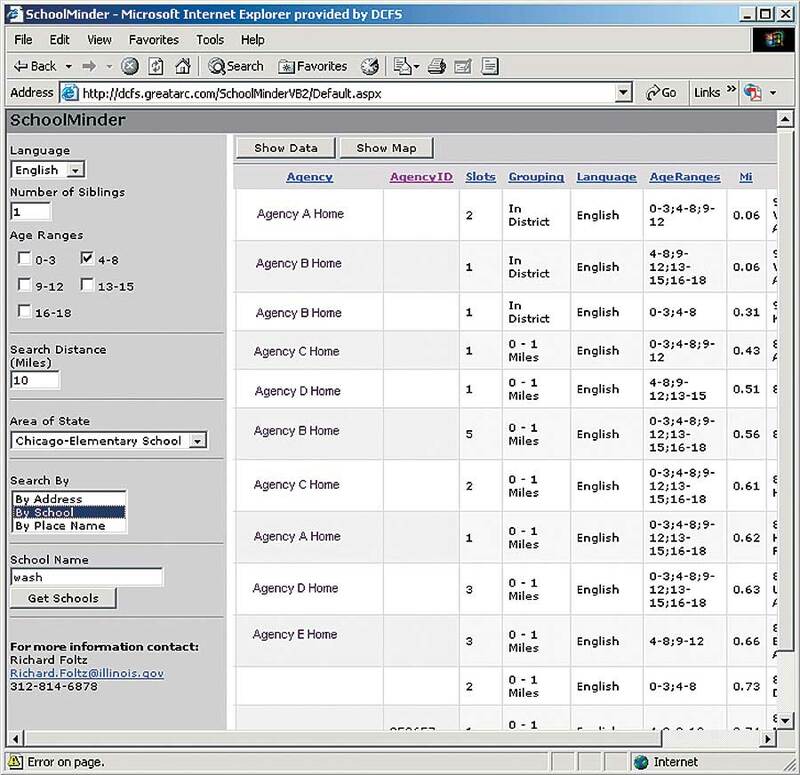 By moving SchoolMinder to a Web interface, placement workers can log in from any department connection, day or night. Additional improvements will enable staff to perform multipass geocoding and search on place-names when both a child's school and parent's address are unknown. For example, placement workers will be able to enter a hospital's name to start a foster home search if an infant is found abandoned there. "The big benefit for me," says Foltz, "is that this system is both industry standard and department compliant. It is a wise choice for the department, both for maintaining our SchoolMinder application, as well as for developing new server-based applications in the future. It's nice knowing I can call on existing department expertise in Visual Basic for Applications (VBA) and ASP.NET if necessary. That leaves me more free time to concentrate on new GIS analysis and reporting than on maintenance of an existing system. It's the former that led to the whole concept of SchoolMinder anyway." For more information, contact Richard Foltz, Illinois Department of Children and Family Services (tel. : 312-814-6878, e-mail: Richard.Foltz@illinois.gov).